How many times have you wondered, "Why aren't there any NEW effects?" Whether you play guitar, bass, keyboard, make beats, or work in the studio - most effects boxes are based on the same old classics. 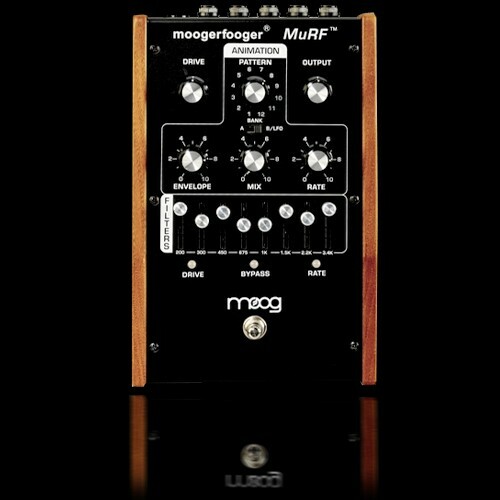 The Moogerfooger Bass MuRF is the antidote to generic, boring effects. MuRF stands for "Multiple Resonance Filter-array". What this means is the MuRF has 8 filters - their levels are controlled by 8 sliders. It looks like a graphic eq, but the sound of the filters are very different: warm and resonant. What is really unique is the ability to animate the levels of the 8 filters in up to 24 preset patterns. The rate of the patterns can be set by a knob, expression pedal, or plug a footswitch into the tap tempo input to match the rate to the tempo of your song. Rhythmic variations can be created by adjusting the levels of the filters. The Envelope control sets the shape of the modulation, which can be set for percolating techno rhythmic modulation or shimmering timbral morphing. Other controls include Input Drive, Output Level and Wet/Dry Mix. MuRF shares the musician-oriented features that are common to all Moogerfoogers. All the audio processing is 100% genuine analog, for warm, fat sound quality. Any line level or instrument level audio signal may be processed. Wide-ranging player parameters may be controlled from the panel knobs as well as from expression pedals or CV-compatible analog synthesis instruments. Components are rugged and long lasting, to withstand the rigors of stage and studio. The MuRF is housed in the classic Moogerfooger "double-wedge" enclosure that may be used on a table or on the floor. For all players, the MuRF will open up new sonic worlds for you!